It was bitterly cold in the days before Christmas. On the evening of December 22nd, I left work early and went to the airport. It was 17 degrees (F), and the clear sky promised that it would get even colder. I managed to get the Tiger started, however, and taxied it over next to a hangar with electricity. The Tiger has a heating pad that heats the oil pan at the bottom of the engine. This helps keep the oil liquid, and makes it easier to start. I also pre-loaded a bunch of our luggage. Jodie and I arrived at the airport early the next morning, finished loading the plane, and took off moments after sunrise, at about 7:30. It was a perfect morning to fly. There was no snow in Maryland, but the ground grew whiter as we flew over Pennsylvania. 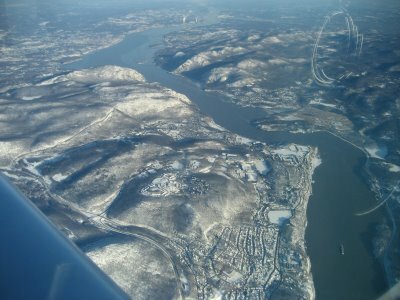 By the time we crossed the Hudson River (at 7,500 feet), snow blanketed the ground, including the grounds of West Point, in the photo below. We made great time. Jodie flew much of the way while I sipped coffee from a thermos. 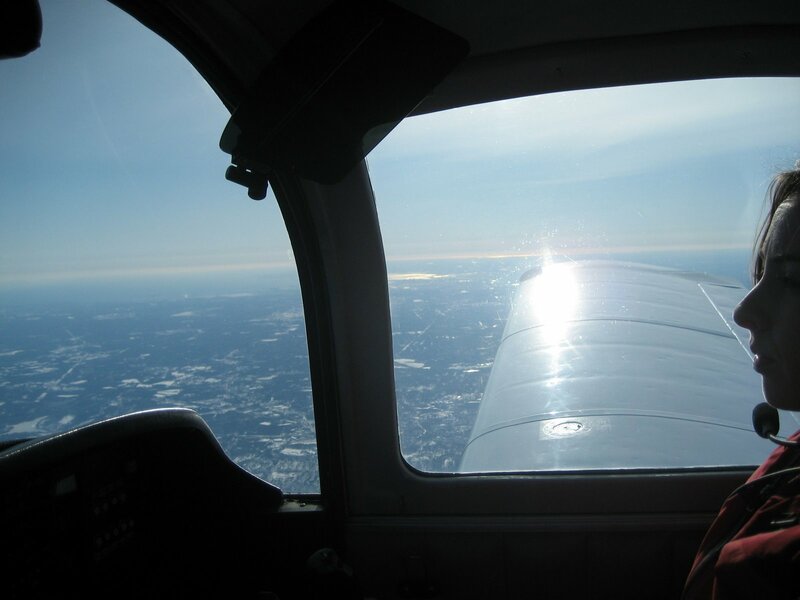 As we approached Worcester, Massachusetts, it was clear that we were going to arrive at our destination at least a half hour earlier than expected. We discussed a detour, then veered east. We crossed the shoreline at Plum Island, then turned north and followed the coast. 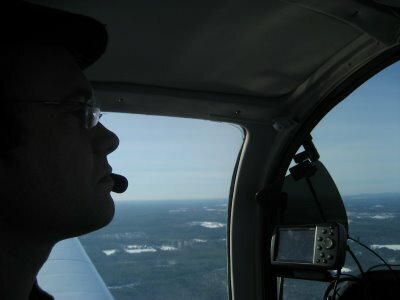 When we got to Wells, Maine, we banked inland and flew low over my nephew's house before landing at Sanford between tall snowbanks. We taxied to the FBO and climbed out. It was 10:15. Even with our detour, the trip had been less than three hours. On Monday the 29th, too few days later, it was time to go. My dad drove us to the airport for a final breakfast at the airport cafe, then we loaded up and taxied to the end of Runway 32. As we accelerated down the runway and lifted off, I pushed forward on the yoke, holding the nose of the Tiger down and keeping us just 10 feet off the Runway. We accelerated to 120 miles per hour then, as we passed my dad's car still idling on the ramp, I let the nose of the Tiger come up and we zoomed steeply up. Jodie gasped, then slapped me. "NOW I'm awake," she exclaimed. We flew slowly down the coast, enjoying the flight, then dove under the outer shelf of the Class B airspace around Boston. Taking a detour to fly over my college campus. . .
. . . we landed at Beverly, Massachusetts, just a half hour after leaving Sanford. Our friend, Rachael, met us and we spent Monday night and the next day visiting with her, my friend Ryan, and other friends in the area. 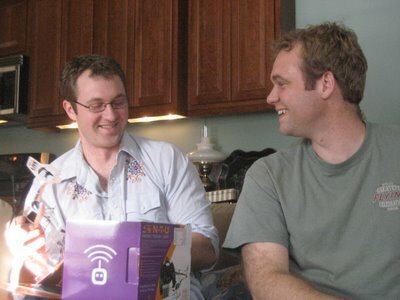 We planned to spend two nights in Beverly before flying sixty miles west to my brother's house for New Year's Eve. I was watching the weather closely, though, and a snowstorm was on its way. On Tuesday evening, I wavered and changed our plans. The snow was not forecast to arrive until mid-morning, but it seemed to me to be moving quickly and I did not trust the forecast timing. There was no hangar available at Beverly, so if I miscalculated, the Tiger would be buried under snow and we could be stuck. I decided we should go, so we scrambled to the airport for a late night flight west. 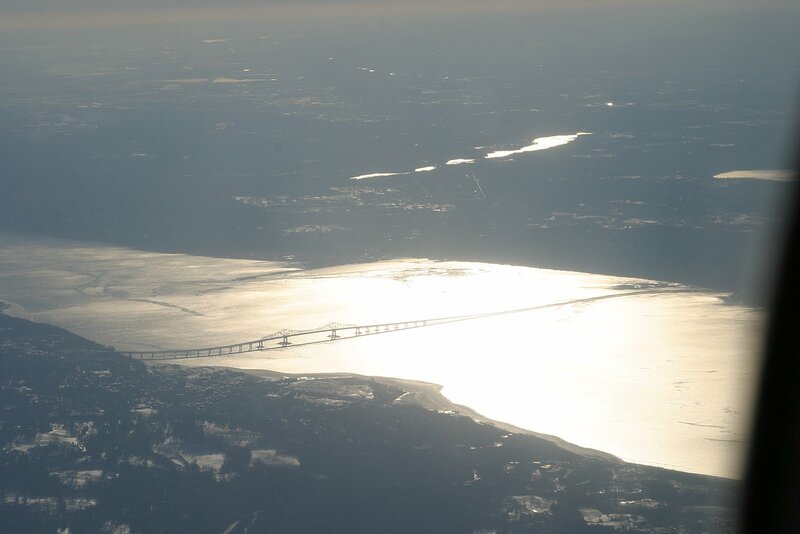 The air was crystal clear, and the lights of Boston sparkled off our left wing as we lifted off. Only twenty-five minutes later, we touched down in Worcester. It was very expensive to put the plane in a hangar at Worcester, over $100 per night. It only cost $10 to leave it outside. Since we planned to be there two nights, I arranged for it to be moved into a heated hangar the next day, to keep it out of the snowstorm and melt off any snow that might have fallen. When we awoke the next morning, New Year's Eve, at 7 a.m., there was already six inches of snow on the ground, and there would be more than ten inches before the storm was over. I was grateful we had flown out the night before. We headed to the airport early on New Year's Day. The sky was so blue it almost hurt my eyes, but the wind was howling right down the runway, 20 knots gusting to 30 knots. The wind shook the plane as we taxied, and the fresh snow blew in whirlwinds. 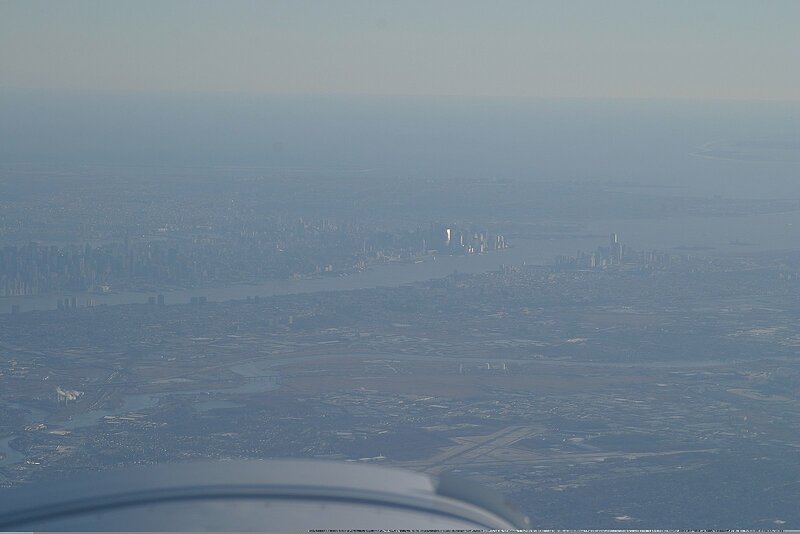 The tower cleared us for takeoff. Accelerating quickly, we took off into the bumpy air and headed south. 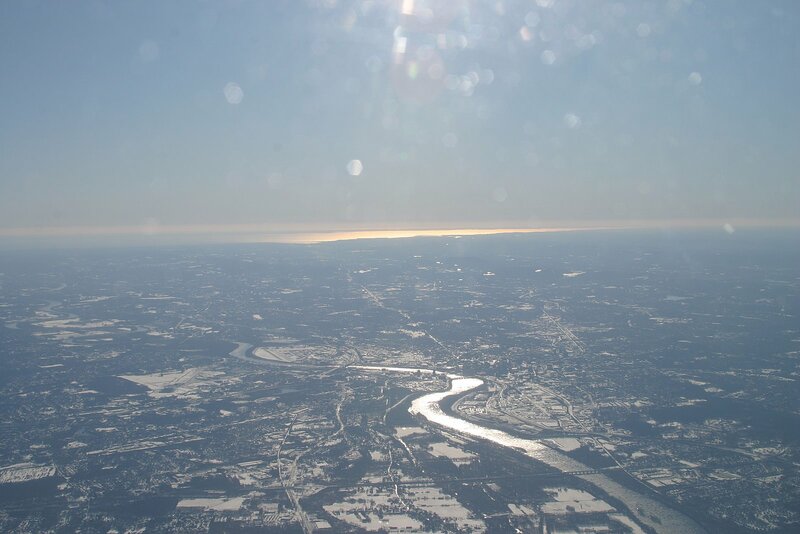 As we climbed through 4,000 feet approaching Hartford, Connecticut, the air became silky smooth and we could see the sun reflecting on the Atlantic Ocean near New Haven. 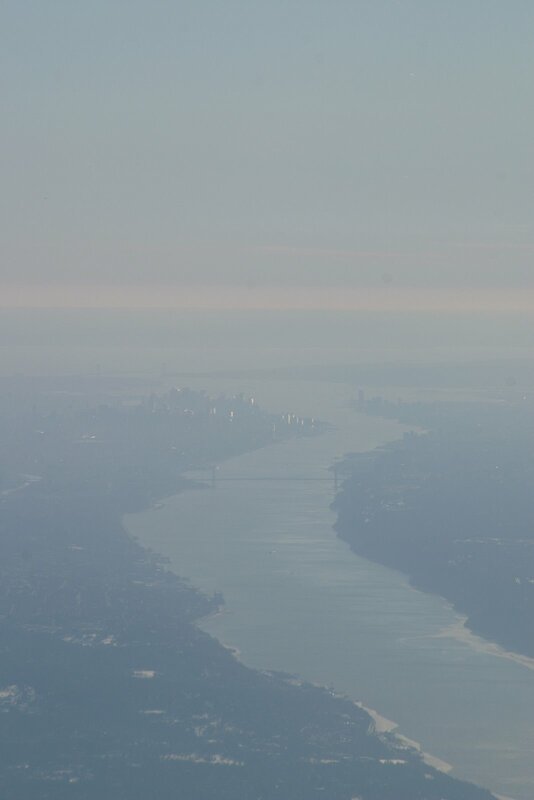 We crossed the Hudson River just north of the Tappan Zee Bridge. New York was a smudge in the distance, through the smog. 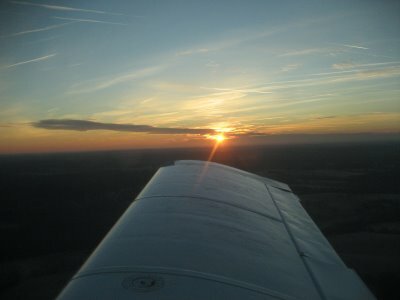 Two and a half hours after lifting off, we landed back at Gaithersburg. Just out of curiosity, I added up the time we spent flying (takeoff to touchdown), then asked Google Maps how long it would take to drive the same distances. It turns out that we avoided more than THIRTEEN HOURS in the car. Many days (including today), I would kill for that extra time alone with Jodie. But generally speaking, not in the car, not in holiday traffic..... This was the perfect way to go.